Lydia came to live with me last fall after I discovered her in a booth among a heap of antiques in an Ohio antiques mall. When I found her, I knew she was mine, despite her price tag. I lifted her high and out of the booth and carried her to the front counter to place her on hold. My name was placed on her and at that moment, she was mine. I adored her wirey skirt, and her chipping cardboard bodice. She’s stood for many years and if she could talk, I can only imagine the stories she would tell about the ladies of the past and what their lives were like and especially tell us about kind of clothes they wore. After I paid for her, I carried her to the car and placed her gently in a secure spot for the 6 hour ride home. I had two friends accompany me on this trip to Ohio and they were so excited and jealous of my lovely new additon to my sewing studio. They asked me what I was going to name her. Almost instantly Lydia popped in my head. I knew that was going to be her name…it was as though she had a spirit attached to her and that force somehow mentally communicated “L Y D I A” to me. It had a nice ring to it and it resonated, ‘antique and vintage’ and that’s just what I knew she needed. I often wonder what her old name used to be. She sat naked in my sewing studio for many months, really not needing an article of clothing to bring out her character. Her wire skirt and aged patina were elements in themselves, to be admired. Sometime later, I came across a forgotten box of vintage laces and whatnots and inside was this divine lace dress that seemed to have been made for her. I took it out and the folds fell out in a puddle on the floor before me. I couldn’t wait, so I dressed her and smoothed out the laces so they would lay flat against her. 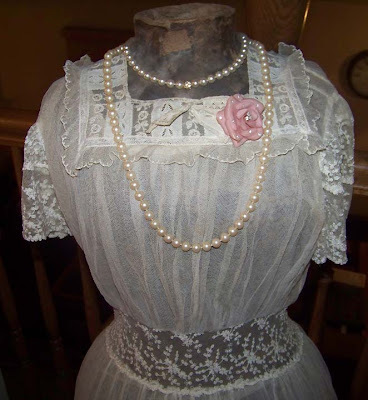 I continued to dig through the box and I found an old, vintage square lace collar and placed it over the simple neckline and it made the dress stand out even more beautifully. Lydia has worn her dress with pride ever since. The cats love to lie underneath and paw at the hem, but that’s okay. Lydia doesn’t mind at all….she’s a lady. Previous postKleenex please: There’s boogers all over Miller Park! I love that dress form… FAB! Congrats… 24 years is a long time!